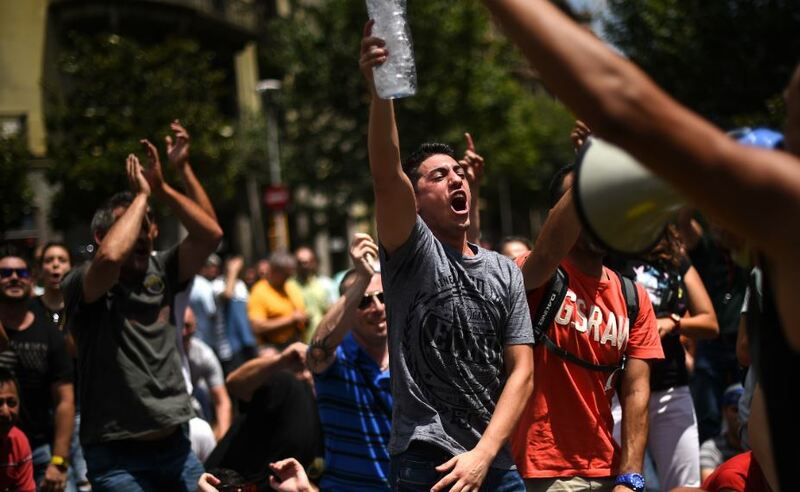 Striking taxi drivers in Spain are demanding state action against Uber. They show that even in the digital economy, strikes are our most potent weapon. Last week Barcelona was brought to a standstill, as endless queues of taxis blocked the city’s main thoroughfares. The taxi drivers camped out on the central Gran Vía de Les Corts, demanding that the government block the spread of Uber and Cabify. They want an end to the so-called “VTC licenses” on which these companies rely. Not only did the drivers paralyze Barcelona, but they also had a contagious effect on their cohorts elsewhere in Spain, who demanded similar measures. Following Barcelona’s example, in Madrid thousands of taxi drivers blocked the Paseo de la Castellana (one of the most important roads through the capital). Taxi drivers from the Basque Country came to Barcelona to show their support, and there were also protest actions, strikes, and demonstrations in other towns and cities, backing these same demands. This taxi drivers’ mobilization has been the biggest labor protest in Spain in the last year. But it is hard to see this as a workers’ mobilization, in traditional class terms. The taxi drivers do not simply have common interests, and nor could all of them be described as working-class. Some forces opposed to these mobilizations characterized them as a shutdown imposed by the taxi employers in order to undermine the competition, and in some cases, this was indeed true. Looking at the dispute between taxi drivers and those operating on VTC licenses (drivers for Uber and Cabify), it would be a mistake to identify one side as “the workers” and the others as “on the bosses’ side.” Both sectors contain exploited and exploited. For instance, among the taxi drivers there are also floteros who hire drivers and sell taxi licenses, exploiting their employees just as the system developed by Uber and Cabify does. Nor can the fight against these digital platforms simply be a kind of Luddism, demanding a return to the past. An effective resistance against the tech giants’ neoliberal hiring practices, as also seen in workplaces like Deliveroo and Amazon, must start from an analysis of the particular developments in each sector, the conditions of exploitation, and the uses of well-practiced forms of workplace mobilization. Just because a struggle is against neoliberalism does not necessarily mean that it is a workers’ mobilization, or that it is necessarily a good thing. We could make a comparison with housing: in the taxi sector as in housing there are mortgage-holders, tenants, and landlords, who come together in venture funds to buy whole buildings and then rent them. In such a situation, there is a tension between the landlords and existing market prices. This does not make their interests a good thing. The taxi drivers’ struggle is not a fight between a collective of workers and their employers. It is a conflict between a traditional sector and a new and rising competitor that threatens its dominant market position. In its fight to defend its established rights it points to the precarious employment conditions under the Uber-Cabify model, while ignoring the precarity in the taxi sector itself, which no one has fought and which many in the sector have benefited from. In Madrid, 17 percent of licenses in the taxi sector belong to people with two or more licenses; they hire others to actually drive the taxis, in working conditions far worse than the license-holders themselves. In the VTC sector (Uber, Cabify), this has become a generalized situation: according to an article in El Confidencial, in Spain there are twenty-six employers who together hold around ten thousand such licenses. The Uber-Cabify model can only work by impoverishing workers’ rights: exhausting hours and pitiful wages allow the VTC license owners to extract maximum profits from their labor. Such exploitation does also exist in the taxi sector, but not for the 83 percent who have their own licenses: indeed, these latter can at times make up part of the chain of exploitation, when they hire other drivers to work on their licenses. As the new digital platforms have sunk roots, the rights of the workers performing each service have increasingly been worn down. But paradoxically, while these platforms appeal to the neoliberal spirit of individualism and freedom of choice as the highest of ideals, they have in fact sparked a collective wave of recognition that this is not all it’s cracked up to be. We have seen mounting opposition to these firms, and indeed protests against the binds they impose on the workers connected to these types of business. Spain has seen mounting protests by those who have suffered the effects of this untrammeled liberalization of working conditions. Terrible conditions on the labor market make it easier to precaritize the few jobs that workers do have a chance of finding, and it is also easier for the companies to find workers on advantageous terms. Today’s unemployment rate (15.28 percent) is in fact at its lowest since late 2008 but is still at a level that would until recently have been unthinkable anywhere in Europe. Many of the new jobs are on temporary contracts, and they are also concentrated in tourism and services sectors (80 percent of the total, according to the Encuesta de Población Activa). Meanwhile youth unemployment stands at 34.6 percent: the only eurozone country with a higher figure is Greece. For the new digital platforms and the denizens of the badly named “sharing economy,” Spain’s unemployment level gives free rein for exploitation. The first to stand up against the poor working conditions under such platforms were the riders working for Deliveroo, the home-delivery food app. Last December they began a series of strikes, protests, and legal actions to force the company to recognize their rights as workers and stop the false practice of treating them as self-employed contractors. As Oriol Alfambra, spokesperson of the Riders X Derechos (“Riders for Rights”) platform put it, “We are not self-employed, we are Deliveroo delivery workers and we will keep on demanding our rights as workers.” Here he was speaking to La Marea, in an interview marking the ruling by the Valencia Labor Inspectorate decreeing that the Deliveroo riders are indeed workers and cannot be considered self-employed. The strike by the workers in the Amazon logistics hub in San Fernando de Henares (Madrid) is another example of traditional collective struggles being used against the tech giants. A three-day strike by the company’s regular workers (known as “the blues” on account of the color of their ID cards) threatened to paralyze Jeff Bezos’s vast company at one of the most important points of the sales year, Prime Day. Most of the permanent employees (80 percent, according to some unions) followed the strike. The company put enormous pressure on the “greens” (temporary workers) to warn them off joining the strike, exploiting the threat that their contracts would not be renewed. But if this helped stop the temporary workers joining the action, overall the strike was a resounding success, including in terms of the company’s angered response. A modern, digital company, at ease with the new times, had to resort to the bosses’ time-honored methods of using strikebreakers to try to thwart the action. According to El Confidencial some 350 new temporary contracts were created in order to weaken the effects of the strike by permanent employees. Movements against the tech companies and their precarious terms of employment are often accused of standing against progress and the advance of new technologies. They are compared to the Luddites of the nineteenth century, who, fearing that the newfangled machines would deprive them of work, tried to smash the looms. As Jorge Moruno explains, this is a one-sided and unfair criticism of these movements, and a powerfully ideologically motivated one. This kind of argument is today being used to set up a contrast between those who want progress and those who resist it — between modernity and backwardness. Without doubt this thirst for a theology of technology — at times an absolute God, presented as a reality we have to accept, and not as a social process — does not care much for the social benefits that could flow from the rise of new technology. This change ought to help cut down our time at work, but in the hands of the capitalists is used to intensify the extraction of profits. Each collective action against the tech giants, from Deliveroo to Amazon or Uber/Cabify, has its own peculiarities. But their strengths and weaknesses also reflect time-honored patterns. In the Amazon strike the split between permanent and temporary workers resurfaced, as the company threw up barriers to the workers without fixed contracts showing their solidarity. This itself showed how important it is for the working class to have stable and well-protected jobs. Nor could we say that there has been solidarity across sectors: the taxi drivers do not see Amazon or Deliveroo strikes as part of a single common struggle. They only mobilized to defend their own sector’s market share. But what the taxi drivers also powerfully showed is that by puncturing the social peace, in strikes that brought the main arteries of Spain’s largest cities to a standstill, they could put their own problems on the national agenda. They again showed that strike action is the best means for any group that wants to fight for its interests to assert its demands. In the age of the digital economy, it may seem that everything has changed. But the working class’s traditional means of improving its situation are as relevant in 2018 as they were a hundred years ago. Antonio Maestre is a Spanish journalist and documentary maker whose work appears in La Marea, El Diario and the TV station La Sexta.